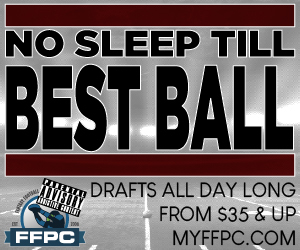 New to our premium content, is FFPC ADP. The ADP is different for the Classic Leagues (20 round with in season management) versus the Draft Expert Leagues (28 round with no season management). This is an important distinction as the position a player would be taken in will be different depending upon the format. This data is for the SATELLITE LEAGUES ONLY. The classic leagues however, share the same format as FFPC Main Event and Footballguys Players Championship leagues, so the data would resemble those events. The players in the satellites, however, may be a bit more casual with the lower buy in amounts. Within each ADP post for the specified time period you will find the ADP displayed overall for a draft, and also by position.